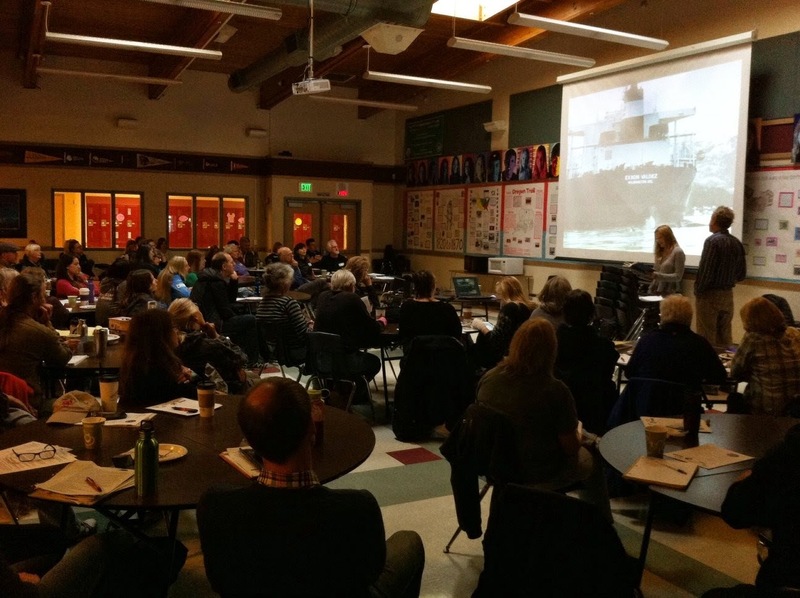 This past weekend there were two great workshops held on back to back days in Friday Harbor, and a few people who weren't able to attend have asked me to post a summary, so I thought I might as well do that here! The first workshop, on Friday the 24th, was the annual naturalist gear-down hosted by The Whale Museum. Part of it was a precursor to Saturday's workshop, and I was asked to present some of the whale and salmon data that I've posted on my blog. (You can see all the blog posts in that series here.) After showing some of my graphs, we had a discussion about the links between whales and salmon. A couple of points that were raised: Dawn Noren of NOAA said the orca and salmon departments within the agency do talk to each other, Sharon Grace emphasized that the biggest challenge to salmon recovery is agribusiness being able to buy water rights away from salmon, and Jeanne Hyde pointed out that we need to start taking more real action rather than just talking about acting. 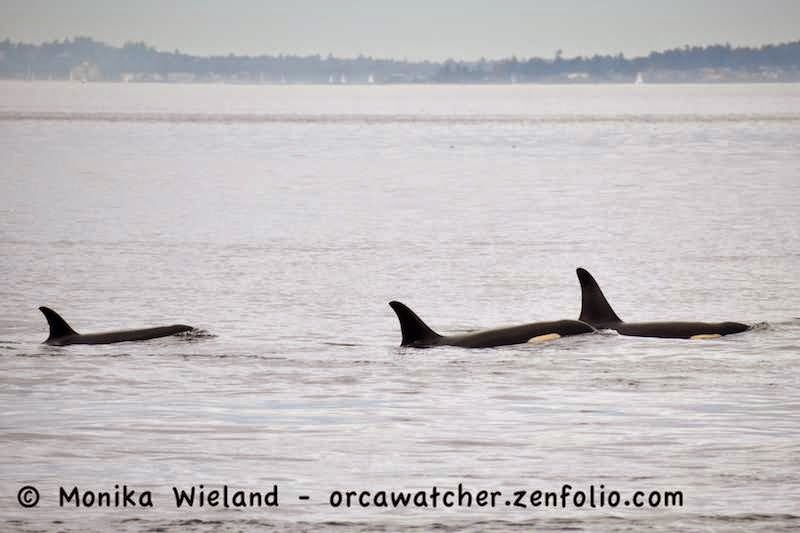 Saturday was a workshop called Southern Resident Killer Whale CALF (Community Action Looking Forward). The idea for the workshop started after the April orca-salmon recovery workshop in Seattle, when it became apparent that the government agencies aren't going to solve the issue of the whales getting enough fish, and that we as citizens need to do something. The day started off with a joint presentation by Eva Saulitis and Craig Matkin, who study orcas in Prince William Sound, Alaska. They're witnessing the extinction of a distinct population known as the AT1 transients, who haven't born any calves since the Exxon-Valdez oil spill and currently number only 7 whales. It was an emotional presentation, I think made even more so as we realized our Southern Residents are at a tipping point, and that before too long we could be in a position to watch something similar unfold here. This heart-wrenching story is documented beautifully by Eva in her book Into Great Silence. Eva's advice to us: "People are going to have to get radical and incredibly outspoken to give the Southern Residents a chance." Craig added: "The numbers just grind you down, but the heart keeps you going....you have to have the heart and the science to get anything done." It was also interesting to hear them talk about how different how both salmon management and salmon culture are in Alaska. Salmon management is a fairly simple affair, by their description, with fewer parties involved. And the culture? "Salmon are like gold" - a concept we need to embrace in the rest of the Pacific Northwest, as well. Ken Balcomb gave a brief talk showing some Southern Resident population numbers, emphasizing in particular that the population increases and decreases have been driven primarily by L-Pod, with Js and Ks holding relatively stable over the years. One interesting point he made: Chinook salmon are the only endangered species that the government gives people the right to kill. This is because our management schemes are driven by economics, and salmon are economically important. What we need to be successful is ecological management, with the ecological importance of salmon emphasized. The main portion of the afternoon was everyone splitting up into three groups: science, education, and action. The goal was for each group to identify what could be done within their purview to advance salmon recovery for the orcas. I was one of the facilitators for the science group, where we focused mostly on data gaps and where more information is needed. Each group had time to brainstorm ideas, discuss them, and prioritize them, then we came back to share them to the group as a whole. Cindy Hansen will be writing up the ideas shared with the whole group in detail and sending them via e-mail to everyone who was in attendance. If you want to be on this e-mail list even though you weren't there, please contact here at cindy@whalemuseum.org - you will also get announcements about future meetings, etc. I'll just summarize a bit of what was shared here. Research: One of the major things that needs to happen is to help make existing data more accessible. A lot of the questions people have are about things that have been studied, but much of this information is not easy available. As far as data gaps go, some of the major things we identified were the reason for low survival among juvenile salmon in the Salish Sea (see the Salish Sea Marine Survival Project for more - this issue is beginning to be addressed on a wide scale); the lack of knowledge about winter diet of the Southern Residents; the population status of local forage fish; and an inventory of regional streams where on the ground restoration efforts are needed. Education: They suggested the idea of linking orca adoption to stream adoption - if you adopt an orca, with it could be information about a stream in your watershed that supports salmon and needs restoration help, further establishing the connections between where we live and the whales. More presence about the issues in the media and on social media could be helpful, with Granny as an iconic "spokeswhale" a la Smokey the Bear relating to the forest fire message. They also mentioned that next summer's Superpod gathering on San Juan Island will focus on salmon so that will be a big opportunity for education. Action: We need to get orcas/salmon a larger lobbying group politically, perhaps crowd funded. The battle of water rights for salmon needs to be fought - and if necessary the economic value of wild salmon and wild orcas can be further expressed to legislative groups. All like-minded groups should be brought together to speak the same message collectively to have the most effect. Links between orca/salmon health and human health can also be further emphasized. As you can see, research, education, and action are all very inter-linked. For now, each group has a few volunteer members that will continue over the winter to discuss was the next steps can be based on the ideas generated at the workshop. Then, in the spring (likely April), we will all convene again as a larger group to talk about taking these next steps. It was also stressed that it will be important to bring at least invite other interest groups in at this point, too, such as commercial, sport, and tribal fishermen. We just have to go out and prove it. 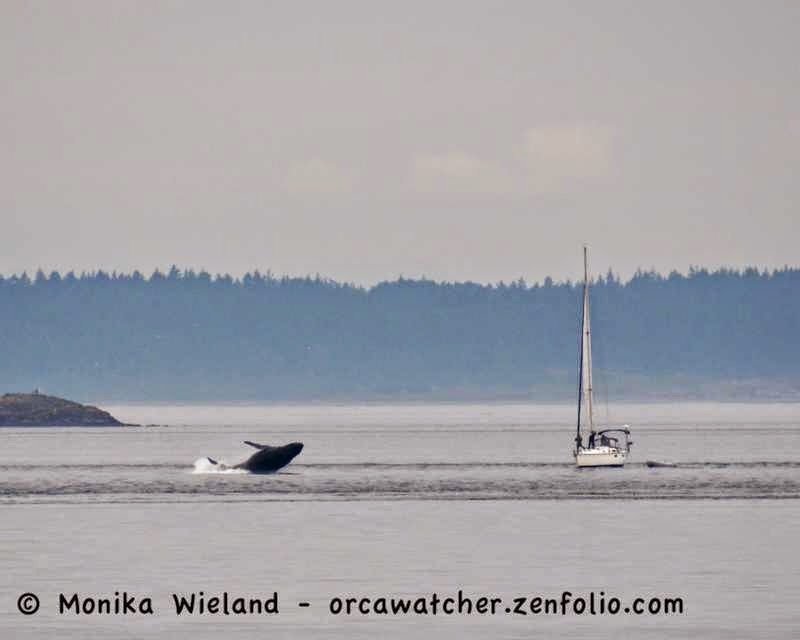 We always say the peak whale-watching season in the San Juan Islands lasts through September. Once October hits, it seems we never really know what to expect. Sometimes the residents stay around still on almost a daily basis, and other times they become scarce almost as soon as the calendar changes. 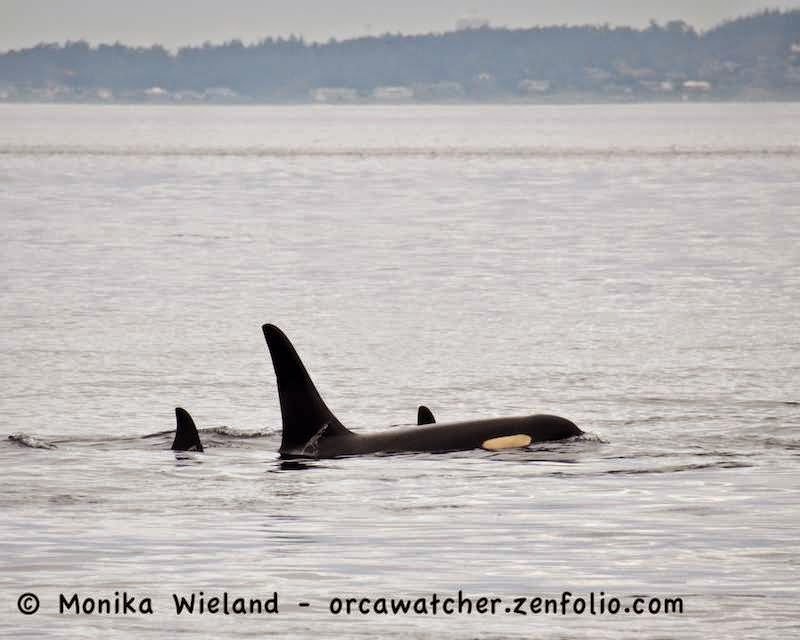 This year, in early October, we had J-Pod and part of K-Pod hanging around. On October 4th, I got to Lime Kiln just in time to see the second half of the group go north. As the whales continued north, I was surprised by not one, but two, small groups of Pacific white-sided dolphins, or Lags. We've had small numbers of these guys around for much of the summer, and occasionally large groups of up to a hundred or more. They tend to be more common a bit further north in the Strait of Georgia and Johnstone Strait, but if they start hanging around here more often I don't think anyone will complain! These guys are awesome. 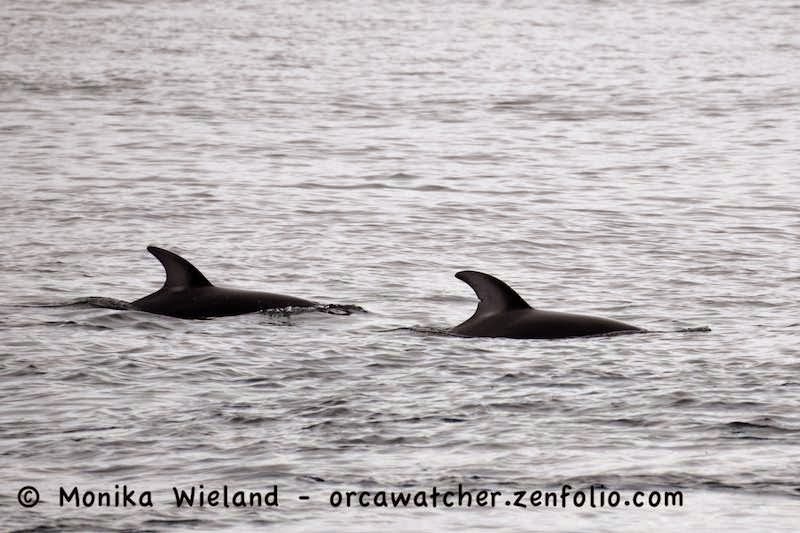 Pacific white-sided dolphins - photo taken from shore at Lime Kiln! The next day, October 5th, I was hoping to catch the Js and Ks again as they made their way back south from the Fraser River. Unfortunately, I *just* missed them, and only got to see K21 Cappuccino head by as the last whale way offshore. Lucky for me, a few hours later, a neighbor gave me a head's up about a pair of humpback whales that might be visible from a park near my home on the other side of the island. Add to the list the harbor porpoises I saw, and that's a 5 cetacean species weekend - not too shabby! 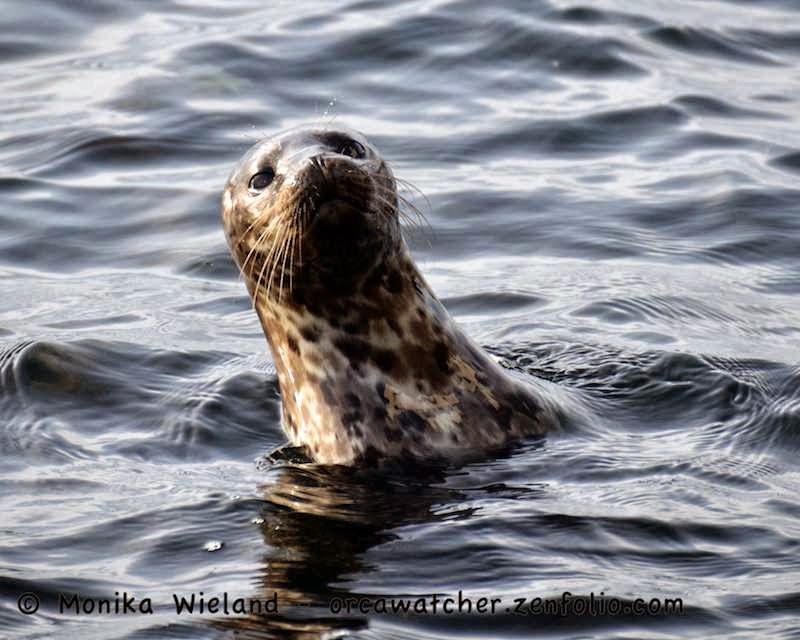 Oh yes, one more photo to share, this one from October 1st while watching orcas milling offshore - this little curious harbor seal, I'm assuming a pup from this year due to his small size, definitely stole the show. It spent the better part of an hour watching us on the rocks from all angles! 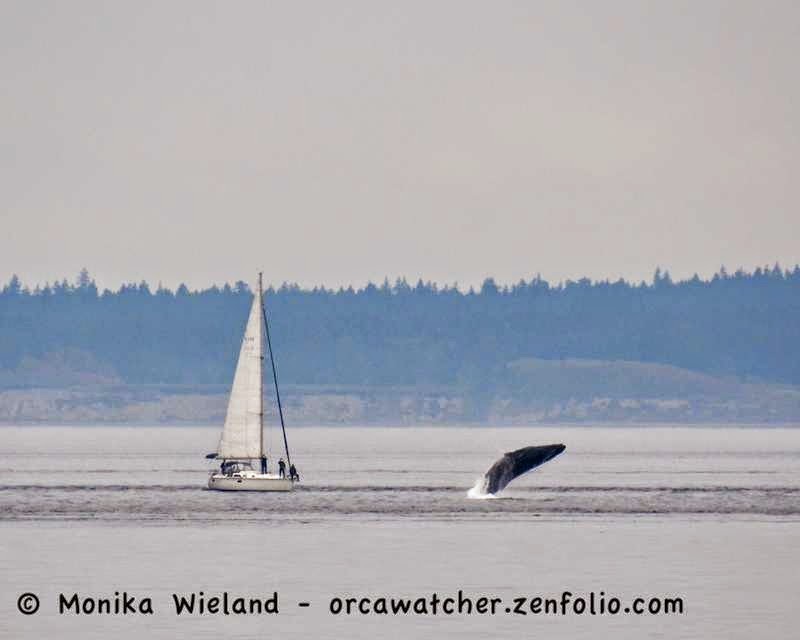 As another summer whale-watching season winds down here in the San Juan Islands, it's an appropriate time to reflect on how these whales are doing. Last year, we had an all-time low in both salmon numbers and whale visits to inland waters, that left many of us wondering what this year would bring. There was an undeniable sense of relief that we had the Southern Residents around a lot this year- no more stretches of days and weeks without whales as we experienced in 2013. Still, despite some proclaiming that this summer was "just like the good ol' days", it really wasn't. While the number of whale days spent in inland waters was certainly up, the amount of pod-fractioning hit an all-time high. We had different groups of partial pods around on almost a daily basis for a while. Yes, there were whales around to watch on most days this summer - but often it was a group of a dozen or twenty whales, rather than 40 or 50 whales or all 79 together in a superpod (by my unofficial count, we only had all matrilines of all three pods in inland waters at the same time on three days this summer). Additionally, while we celebrated the birth of L120 this summer, we also experienced yet another year where deaths outnumbered births, and L120's arrival ended the longest drought in births ever documented, with 25 months having passed since J49 was born. So, to put it simply: this year was better, but all is not well. 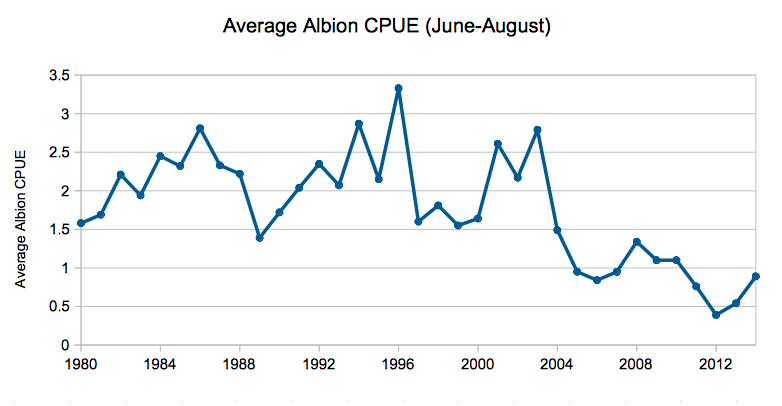 Average Albion catch per unit effort (CPUE) on the Fraser River for Chinook salmon for June 1 through August 31 from 1980 to 2014. Here I'm using the average CPUE as a metric for how many salmon are returning to the Fraser River during the summer months, when Fraser Chinook are the predominant prey item for Southern Residents. From this graph you can see that 2014 was the best year of the last four (fish hatched in 2010 returned this year), but that numbers are still severely depressed from historic counts. Not surprisingly, the number of whales we see in inland waters is directly (and significantly) correlated to how the Fraser River Chinook salmon are doing. Finally it seems that, at least among the general public, salmon is the hot topic issue surrounding these whales. In the past, attention has focused on proposed vessel regulations or controversial research techniques, but now more than ever it seems like people are being educated about, and are talking about, the fact that the age-old adage is true: no fish, no blackfish. With this increased attention on the issue that really matters, NOAA has been under further scrutiny as the agency that is tasked with developing and implementing a recovery plan for the Southern Residents as part of their listing under the Endangered Species Act. 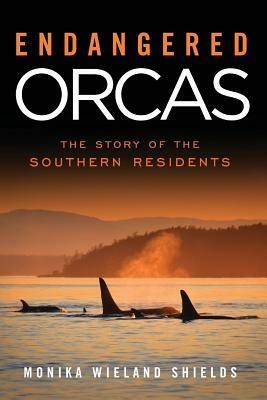 This spring there was an orca and salmon recovery workshop in Seattle, which I attended. Perhaps the most astonishing thing to me was the apparent lack of communication between the so-called "whale people" and "salmon people". Several of the salmon specialists who spoke mentioned how exciting it was to be talking to someone different - namely all the people present who were there from the "whale side". I had heard about the phenomenon of scientists working within the "silos" of their particular disciplines or sub-disciplines, but never was it more apparent to me than at that workshop. Here we have two species whose recovery plans are undeniably interlinked, yet it seemed like the two groups responsible for those species weren't working together. I'm certainly paraphrasing here, but the message I heard from the orca management side is that when it comes to the prey recovery portion of the killer whale recovery plan, they defer to the salmon recovery plan. And the folks representing the salmon recovery plan basically said, "We do nothing to take killer whales into account." But maybe I should back up a little bit. Is the link between Southern Residents and Chinook salmon as obvious as I think it is? 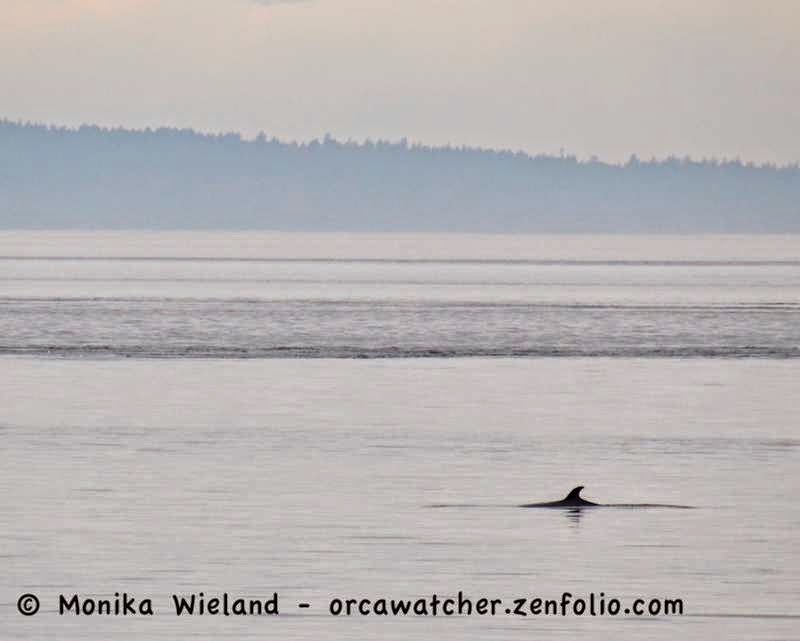 It is now common knowledge that Chinook are the predominant prey item for the resident orcas, making up more than 90% of their diet during the summer months. Evidence from a small number of prey samples in the winter also indicate that Chinook remain an important food source year-round. But when I attended a lecture this fall given by NOAA management, they made a statement that floored me: there is no evidence that survival or recovery of the Southern Residents is more strongly linked to any particular Chinook salmon stock than to a coast-wide Chinook abundance index. They recognize a correlation that has been published by John Ford linking Southern Resident population numbers to a coast-wide Chinook abundance index, but again haven't found links between Southern Resident life statistics and any particular salmon runs. I should take a moment to say that I do not have anything against NOAA. I believe the people there are passionate about these whales and their recovery, and they have done a lot to add to our knowledge of these whales - for instance, the information on year-round Southern Resident diet comes from work done by NOAA scientists. But their hands are also tied, to some extent. They have to try to balance pressures from multiple interest groups when working on recovery plans, and they only back up any recovery measures with scientific data. Just like how we all "knew" Southern Residents were spending the winter months on the outer coast, we couldn't prove it until they were satellite tagged - and that hard data proves instrumental for things such as keeping these whales protected when NOAA is petitioned for their de-listing, as happened in 2013 by a group of California farmers. So it was shocking to me that what I assumed was an undeniable link between Southern Residents and Fraser River Chinook apparently has not been demonstrated scientifically, which is what I heard from the NOAA management. NOTE: These are not complete or perfect statistical analyses and should not be taken as such. These are first-stab attempts at looking at these numbers by biologists who are not mathematicians. These results have not been reviewed or endorsed by anyone. 1. The Fraser River follows different trends than coast-wide salmon numbers. Coastwide Chinook salmon abundance (including California, Oregon, Washington, British Columbia, and Alaska) is indicated in blue and referencing the left Y-axis. This data was compiled by Jane Cogan from Pacific Salmon Commission and Pacific Fishery Management Council reports. The orange line indicates Fraser River terminal run size (including spring, summer, and fall Chinook runs) and references the right Y-axis. This data was also compiled by Jane Cogan using NOAA Technical Memorandum NMFS-NWFSC-123 for 1980-2010 and Pacific Salmon Commission data for 2011-2013. 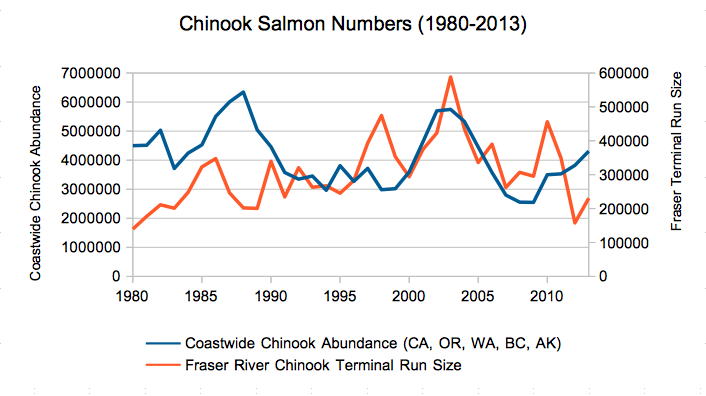 There is not a statistically significant correlation between coast-wide Chinook abundance and Fraser River terminal run size (ANOVA, p > .05). 2. Southern Resident Killer Whale birth rates are significantly correlated with summer Fraser River Chinook numbers; birth rates are not significantly correlated with coast-wide Chinook abundance. 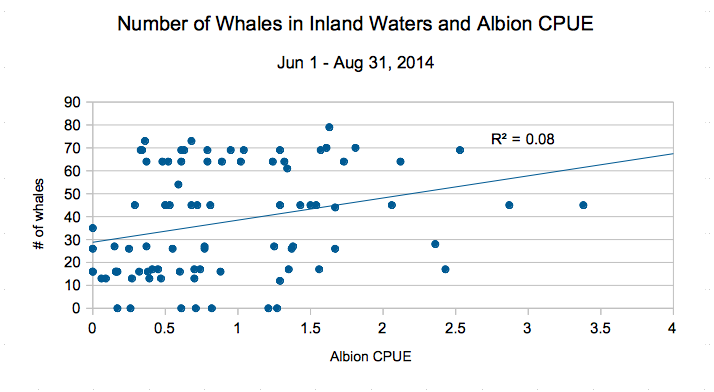 Southern Resident Killer Whale birth rate compared to average Albion CPUE for June-August from 1980-2014. Birth rate was calculated from Center for Whale Research data as number of births per number of reproductive females per year, where a reproductive female was defined as any female between the ages of 11 (youngest documented mother) and 42 (oldest documented mother) who did not have a calf the previous year. 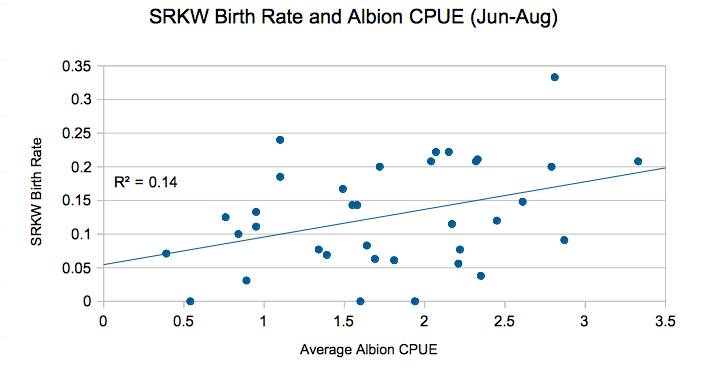 There is a statistically significant relationship between birth rate and June-August average Albion CPUE (ANOVA, p = .026). 3. 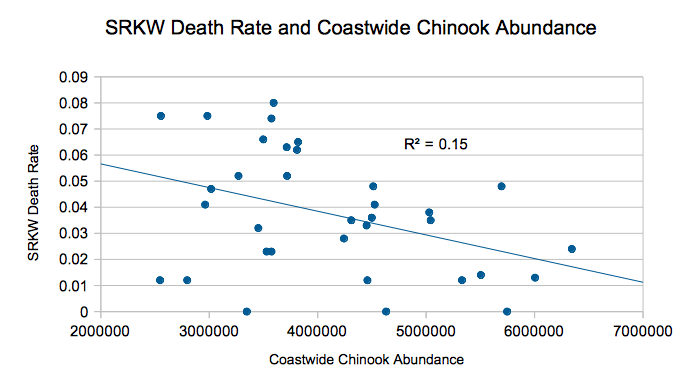 Southern Resident Killer Whale death rates are significantly correlated with coast-wide Chinook abundance; death rates are not significantly correlated with Fraser River summer Chinook numbers. Velez-Espino et al. went on to conduct population viability analyses for the Southern Residents under different management scenarios, manipulating potential restrictions or allowances of fishery harvests to determine if fishery management could potentially have large enough impacts on salmon abundance to influence Southern Resident survivability and fecundity. They conclude that the interaction effects of fisheries management on Southern Resident vital rates are small and that restricting fisheries may not be an effective management action. There aren't nearly as many fish as there used to be. 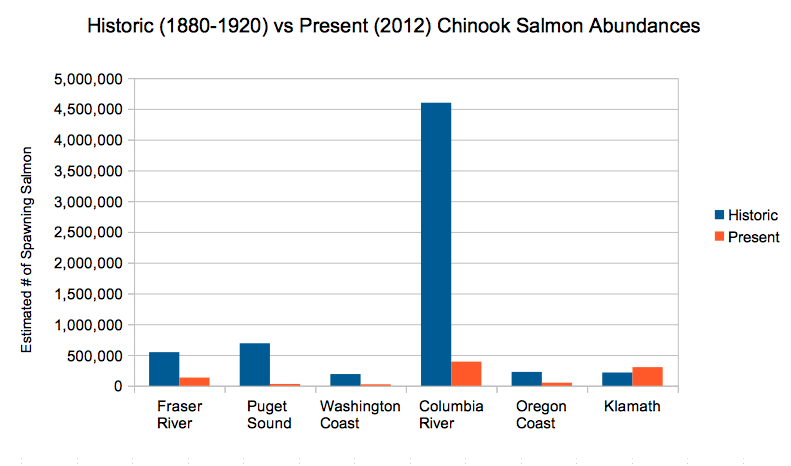 Historic Chinoook salmon numbers (as presented by Jim Myers of NWFSC from sourced dated between 1880-1920) compared to present (2012 data from Pacific Salmon Commission and Pacific Fishery Management Council reports compiled by the author) Chinook salmon numbers for several major west coast rivers and regions. Klamath River historic data averages two different conflicting reports. For the most part, Chinook salmon numbers are a small fraction of what they used to be. And fisheries only harvest a small percentage of current salmon returns. This means that when we're talking about the number of fish being taken by fisheries, we're talking about a pretty small number of fish, especially relative to historic salmon levels. Taking this into consideration, I don't think it's surprising that fisheries aren't projected to have a large enough impact on the number of fish available to the whales to impact their viability at a population level. While restricting or closing fisheries would result in more fish for the whales, I think what these analyses really tell us is that it still wouldn't yield enough fish. We need to do something more, something bigger, to recover salmon numbers. The need for action can't all be laid on NOAA's shoulders. The Fraser River is admittedly out of their jurisdiction. While there is a petition pending to extend Southern Resident critical habitat to include the outer coast, the fact of the matter is the designation of critical habitat doesn't do anything to support recovery or replenishing of resources within that habitat - it only instigates that future permitting within the critical habitat must consult the endangered species recovery plan. I've come to believe that they simply don't have the tools on their own to instigate the kind of efforts we need to see happen. While I hope they do play a major role in regional salmon recovery efforts on behalf of the whales, we, as concerned citizens, can't just sit around and wait for that to happen. This article is meant to help ignite the conversation of what we can do to help make sure that it happens. One perfect opportunity to be a part of the ongoing discussion comes later this month. On Saturday, October 25th at Friday Harbor High School, The Whale Museum and the Salish Sea Association of Marine Naturalists are hosting a workshop on this exact issue. What can we do to make sure real action gets taken to help boost Chinook salmon numbers for the particular stocks that are vital to the Southern Residents? I hope to see you there.